There are very few things more fun and relaxing than casting your line from the top of a high-quality stand-up paddle board (SUP). Fishing kayaks used to be the default option, but paddle boards are zipping along in numbers for good reason. However, it can be a bit challenging to decide exactly which SUP is right for you and your fishing and paddling style. We’ve done the work for you to see which of these SUPs are the best out there and worth looking into in more depth. We’ll share the specs for 11 of the best paddle boards for fishing, as well as their pros, cons, and special features that make them stand out. When the Atoll inflatable paddle board came out it was only offered in army green, which divided people. However, now you can get it in light blue and burgundy, as well. The new colors are more appealing to some paddle boarders, specifically women. This board measures 11’ long, 6” high, and 32” wide and weighs less than 20 pounds. That makes it the most lightweight board you’ll find on this list. It doesn’t have to sacrifice stability either. 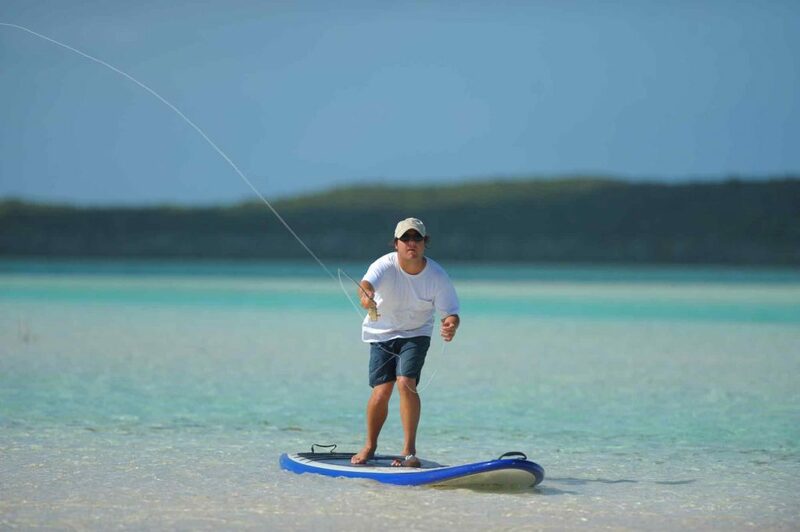 It’s a great choice for beginners as well as those who have a bit more experience paddle board fishing. It has a nice tapered shape that does well with wind and waves. It’s also a versatile option that can be used for fishing, paddling, fitness, camping, and more. The deck off the board is EVA foam traction emblazoned with the Atoll logo. You’ll also find a webbed carrying handle toward the middle of the board with a neoprene grip. There are also eight D-rings on the side for securing coolers, tying down gear, or adding a kayak seat. The front of the board has more D-rings and one is on the rear to make a total of 15 of them. When you flip over the paddle board, you’ll see a 2+1 fin configuration with fixed small side fins and a removable center fin. It is also well-made with dual-layer military grade PFV and drop stitch core for stiffness and durability. 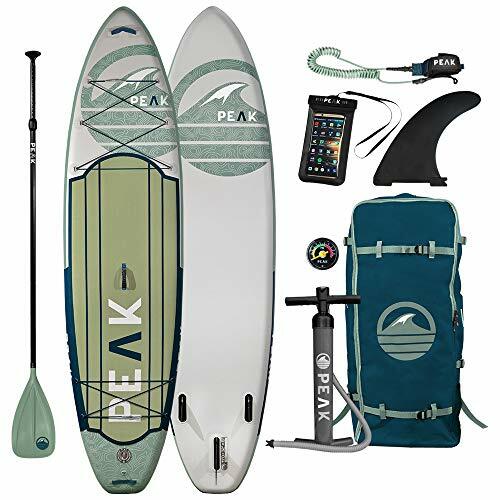 This package comes with what you need to get going including a backpack, 3-piece aluminum paddle, 10’ coiled SUP leash, dual-action pump, and a repair kit. 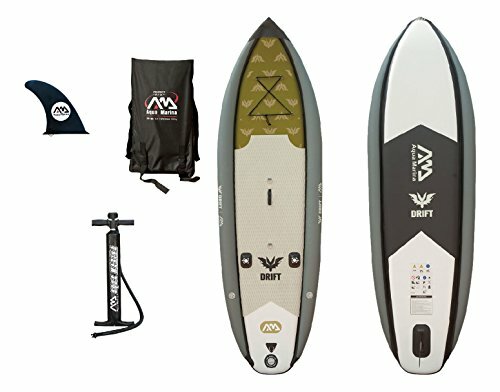 With the Aqua Marina Drift, you get a 10-foot and 10-inch board that should be just the right size for fishing and recreation for those who prefer a larger board. It’s also 38 inches wide to offer stability and safety while you fish. One of the things that sets this paddle board apart is the two side air chambers, which helps promote balance while fishing or paddling. As far as the thickness of the board, this one is six inches, which is fairly standard. The Drift has double-wall drop stitching and is made of military grade material for durability. While it may not seem strong when uninflated, once it’s inflated the board is hard and stiff to show off the strength and durability. It’s a board that can hold up for hours in the sun and carries up to 290 pounds. The traction pad on this paddle board is heat embossed and diamond grooves for durability and superior traction. It is soft but stiff and won’t hurt your feet or knees when spending time on it. The Drift also features a total of seven stainless-steel D-rings, four of which are found on the nose. Two are on the traction pad to hold a cooler while the last one is on the tail for your leash attachment. There are a total of two built-in rod holders on each side. This allows you to put your rod on the board and paddle until you find a spot you want to fish without worrying about losing it or it falling in the water. The Elkton Outdoors Grebe is a large 12 foot in length with a 6-inch thickness and 36 inches in width. All of these measurements are great, but the length is what stands out for fishing on a paddle board. You have a ton of space to keep your cargo and gear. It’s also stable so you can easily balance even when taking on serious fish. This paddle board is made of a heavy-duty PVC, which is the toughest and safest option on the market. When you get a chance to inflate the board, you’ll also get the chance to see how well all the components are put together. With the drop stitch technology, the SUP looks like it’s a single piece of board that is lighter than hard boards at only 26 pounds. The traction pad is great on the Grebe with an EVA pad that covers the majority of the back of the paddle board. It will stop anything from slipping into the water while being soft enough for naked feet. This board has two separate storage areas with six D-rings on the deck and another four on the end. There are also another six that can be used for anything you like. This is more than enough room to store a tackle box, cooler, and the extras you need to bring along with you. There are three carry handles on the paddle board, one at the center and two at the ends of the board. They’re soft but rigid to offer easy transport and a firm gripping area. The iRocker All-Around is an amazing board that will give the performance you need in all sorts of conditions. It’s not manufactured to be ideal for surfing, but it can do just about everything else really well. It’s designed for those who are heavier or who will be bringing passengers along, which makes it a great family board to share. This board is 11’ long, 32” wide, and 6” thick. It’s 27 pounds and can hold up to 435 pounds in total. It’s quite stable under your feet and feels more rigid than the 2017 version. It has a nice rounded tail which makes it easier to pivot in a smooth manner when some boards so. The three-fin setup also adds to stability and better turning. The All-Around comes in an assortment of colors including white, gray, sea-foam, and blue. The paddle that comes with it will also match the board you choose to purchase. The look is sleek and elegant with a nice deck pad on top. Handles are included but they can be removed at all. You’ll find them on the front with the bungee cord that goes through the D-rings. There’s also plenty of space to stash your gear on the nose. More D-rings can be found in the center to put your carry strap or kayak seat. Another is on the tail to string up your leash. While some would prefer all the fins be removable, the side fins cannot. However, the center fin easily comes off and the fins are easy to use. Taking the middle fin off is simple and makes it easy to grab your board and go wherever you like in minutes. Tower is a reliable brand that offers high-quality paddle boards in all sizes and configurations. The company is known for its great quality and consistency when it comes to the products they put out. This board is 10 feet 4 inches long, which is fairly large. Larger paddle boards tend to be best for those who want a stable platform and a steady pace, which is also what makes them a great SUP for beginners. As far as thickness, it’s 6 inches which is typical for a fishing paddle board. It also has a weight limit of 350 which is pretty reasonable for two smaller riders or a rider and their pet. You can expect a high level of durability, perhaps as much so as a hardboard, which is uncommon. It’s made of military-grade PVC and reinforced by industrial drop stitch construction. That means you can ride the board anywhere you like and don’t have to stress about cracks or dings. The board has a total of four D-rings on the head connected by bungee cords to offer a cargo holder. There’s also a D-ring on the back which keeps you secure without any trouble. The gripping pad covers about half of the deck and will keep you stable while still being comfortable. 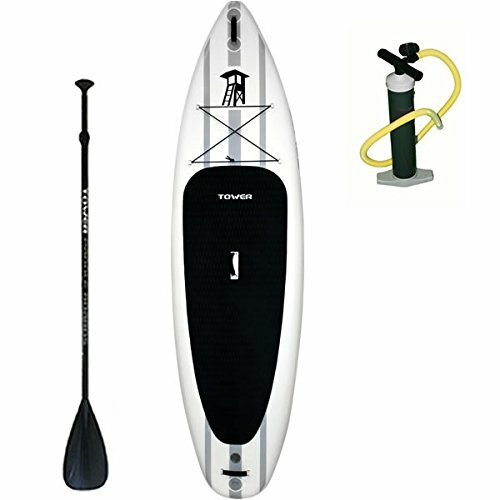 The Tower Inflatable comes with a three-piece fiberglass paddle and a high-pressure hand-pump. The paddle is high-quality and should last you a long time, unlike some of the other accessories you find in kits like this. However, the hand-pump can take some time to inflate your board to the correct air pressure. This is a massive fishing paddle board at 12 feet and six inches long, six inches thick, and 40 inches across. 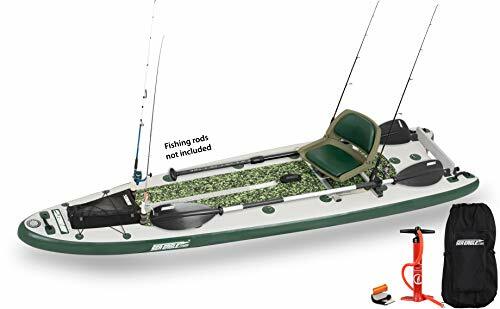 That is also what makes this a paddling board that has enough space for you to comfortably spend the whole day on the water with all of your fishing gear available to you. The width and the swallow tail design offer high stability, even enough to allow you to cast while standing. This is clearly made to be a fishing platform which means that while it may not be right for everyone, it’s decked out for those who live to fish. 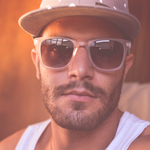 It’s well-made from military-grade materials and a drop-stitch construction. 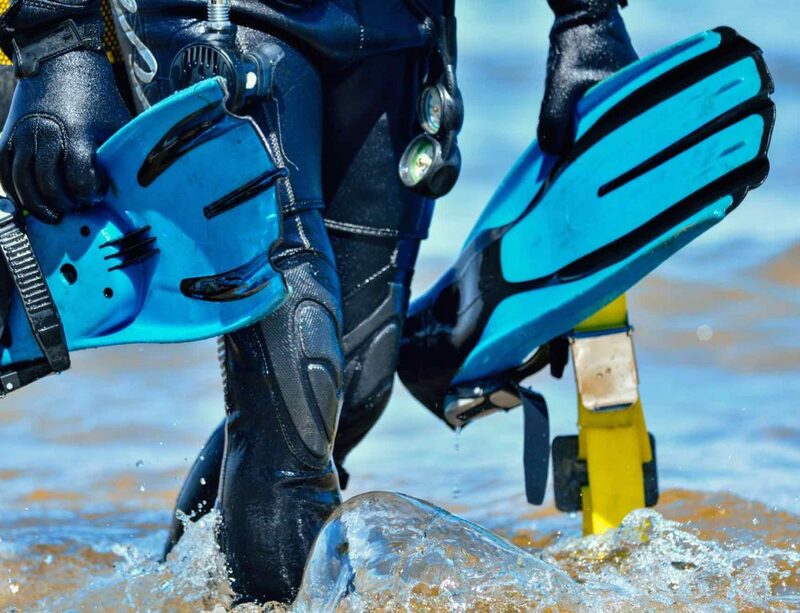 The fins are made to be durable and the D-rings, grab handles, and air valves are all made with high-quality care. The features are what make this paddle board seriously stand out. The top deck has an EVA foam deck pad for traction and to prevent against punctures and abrasions from fish hooks. There is also a built-in fish ruler on the pad, so you don’t need to bring one along. The middle of the FishSUP 126 has a carrying handle which is easy to use when the board is inflated. There are also handles at the nose and tail. The nose of the board has four D-rings while there are eight on the side of the traction pad. There’s also a bungee storage area for a backpack or storage box. The air valve is at the nose, as is a paddle pocket to hold your paddle when not in use. 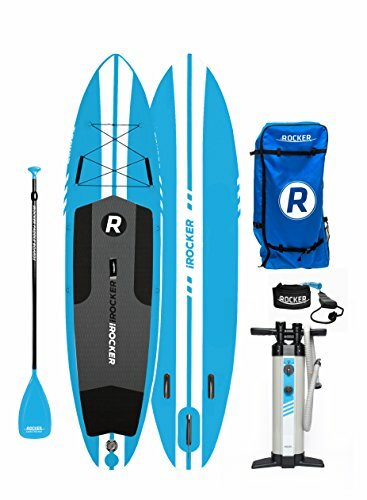 The package with the paddle board comes with a paddle, backpack, multi-purpose storage box, fish rig, SUP pump, and a repair kit. 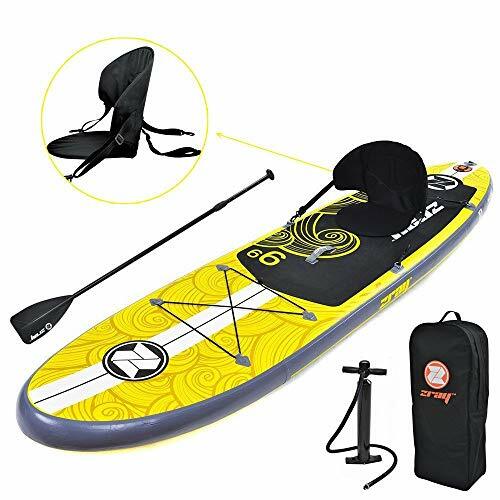 While paddle boards may not be the first thing you think of when it comes to paddle boards, their ACE-TEC is quite a fine option for fishing and paddling. It’s a user-friendly option with resiliency and versatility that you want in your paddleboard. The paddle board comes in three sizes, but we’ll be focusing on the 10-foot 6-inch model. 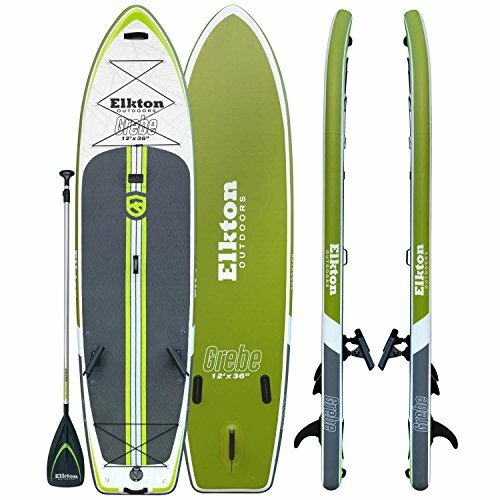 This board has an EVA deck pad which is comfortable while still offering the traction you need when paddling. The grip helps with balance, which is ideal for someone in choppy water or for beginners to paddle boarding. The center width is about 31 ½ inches which are enough for stability without sacrificing any maneuverability that you may need. The board can be used in a single or tri-fin formation, which is great for those who want to mix things up on occasion. For flat water, a single fin often works best while waves do well with a tri-fin. However, the side fins do not come with the paddle board so those who want to use all three fins will need to purchase them separately. The ACE-TEC weighs in at 30 pounds which makes it durable and strong. Getting it from your car to the water isn’t too bad. The process used to make the paddle board is called Thermoforming, which is the same method that is used to create windscreens for airplanes. The one issue with this paddle board is that it doesn’t have a ton of extras. It doesn’t come with a paddle, backpack, or any other accessories. 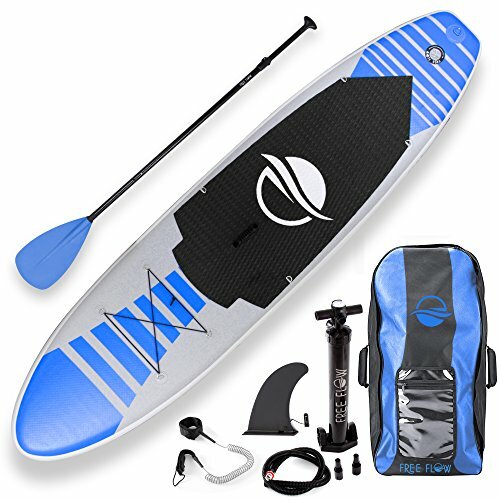 Those who are new to the sport will need to get those things separately when choosing this paddle board. The SereneLife Premium is ten feet long and has a classic recreation design. It’s made of PVC with a thickness of six inches to keep the board stable when on the water. There is a non-slip pad on top of a portion of the board to prevent slipping while paddling or fishing. It is fairly easy to inflate and comes with an air pump, paddle, and leash so you don’t have to purchase those separately. The paddle board can also be rolled up and stored in the complimentary storage bag that comes with it so it is simple to transport. This paddle board has nine D-rings on the surface. Four of them are on the front with bungee cords to offer storage space. The other five D-rings are on the traction pad with one near the air valve. This offers a way to attach your wet bags or other gear on the board. The paddling board has a total of three fins for excellent tracking and to keep the board from going in a direction you do not want it to. The middle fin can be detached while the side fins are permanently attached. Attaching the third fin is simple and requires only inserting the last fin and securing it with a plastic clip. The SereneLife has a carrying handle which is located in the area where the traction pad is. It’s directly attached to the board in order to make it possible to transport even when inflated. It can also be used to pull yourself back up if you fall in the water. The ISLE Versa is a stand-up paddle board that is largely created for use by beginners. However, unlike some of the beginner boards, this isn’t made from heavy, low-quality wood. Instead, the Verse is made from top of the line epoxy. This means the board is reasonably light while remaining durable. This board is only 27 pounds, 4 ½ inches thick, and capable of supporting riders of up to 275 pounds. This makes it easy to maneuver without sacrificing any stability. This can make it a lot easier to learn on for a beginning paddler fisher. The Versa SUP has a comfort-groove handle in the center of the board to make transport and carrying a breeze. The board itself has a patterned surface that helps prevent slipping while padding. There’s also a removable middle fin that can easily be removed and attached as needed. This is a plus when some removable fins can be a hassle to remove. Another perk of the Versa is that it’s a reasonable price, which is also great for beginning paddle boarders. It also makes a good option as a spare board due to the price and quality of the materials that are used. It’s also nice that you can send back the board within 30 days of purchase if it isn’t meeting your needs. This is a well-rounded board without any major weaknesses that can be used for most any activities you’d want to participate in on a paddle board. 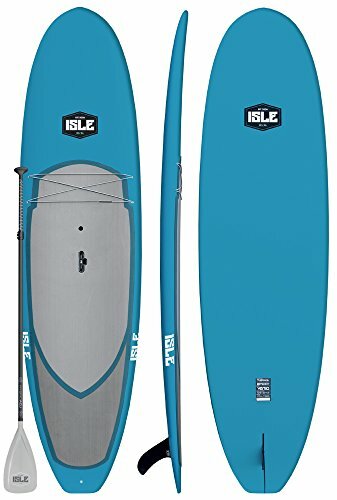 It can be used to surf, fish, practice yoga, or whatever else you want to do as a beginner or intermediate paddleboarder. The NRS Heron is an inflatable SUP that is stable for fishing and can hold weights of up to 300 pounds. It also comes with a pump and a carrying bag, so those are things you don’t have to worry about. The Leafield D7 valve used on this paddle board is one of the most reliable and efficient in terms of inflating and deflating. This is an 11-foot-long board with a five-inch thickness on the deck and seven-inch thickness where the side chambers are. It has been made of PVC drop-stitch material and utilizes a dual sidewall construction for durability. 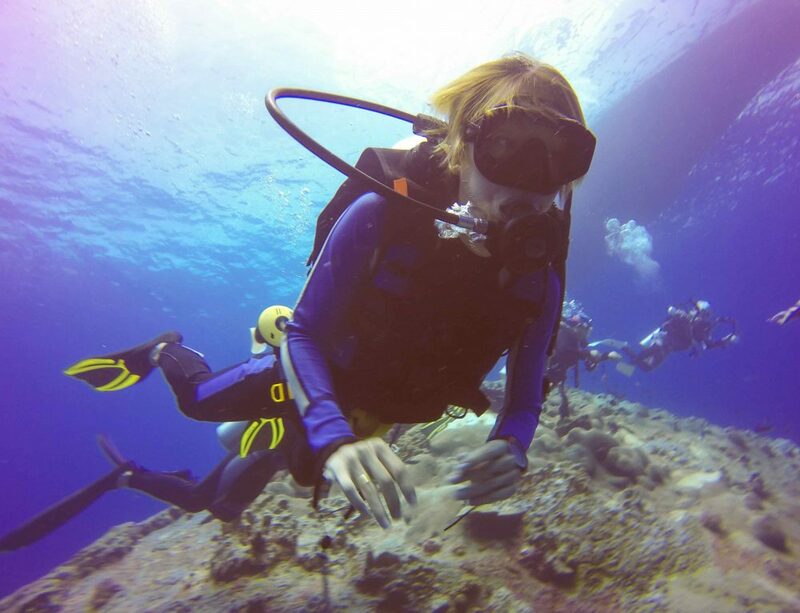 The Heron inflates to up to 20 PSI and has a total air volume of 364 liters to hold its shape well in the water. It also uses an acrylic stiffener to ensure the board is stable and stiff without making it heavy or hard to roll up after it has been deflated. There are six D-rings on this paddle board so you can attach whatever you want in whatever way you desire. There are also three fishing accessories mounts and a bungee cord storage area at the nose. The back of the paddle board has a tie-down area for your cooler or extra fishing gear. The Heron comes with a three-year warranty, which can give you peace of mind that you are buying a quality paddle board. 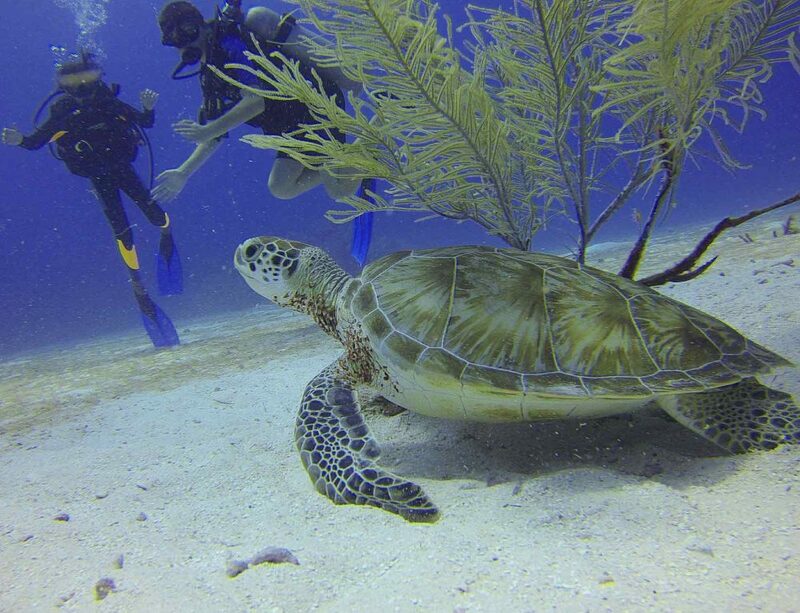 In addition to the board, you also get a repair kit, a high-pressure pump, valve adaptor, pressure gauge, carrying kit, and two different fins. Those who are okay paying more for quality will find that this paddle board is one of the top choices for fishing. It’s sturdy and durable with plenty of room and a large weight capacity. The Zray X2 is fairly well-equipped when it comes to D-rings and offers a total of 10. There are four of them threaded with bungee cord for your cargo and storage. There are another four in the middle of the board to the sides. These work well for attaching backrests or carrying straps. There are also two D-rings on the tail with one underneath and one on the deck. The shape is fairly average with a wide nose that carries through the body. This means it isn’t going to be the fastest paddle board out there. However, it is still a fun board to paddle and fish on if performance isn’t key for you. The board has been created to offer a lightweight and a reasonable cost, which means it has a drop stitch core covered by a layer or PVC. There is a softly textured deck pad on top that covers about half of the paddle board, which allows you to experiment and use the stance you want. You can easily add a backrest or bring along a dog without worry. While most paddle boards have three fins, this one has only one. This helps with tracking but can make stability and maneuverability a bit of a concern. You can remove and attach the fin to transport the board more easily. 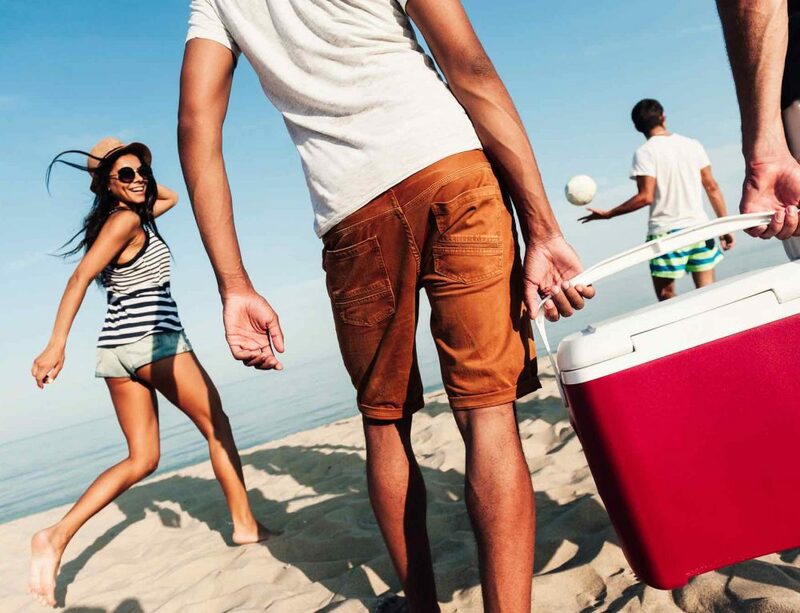 The package with the board comes with an adjustable aluminum paddle, as well as a hand-pump. Neither are overly excellent, but they do the job for a beginner or someone who is on a budget. Fishing stand-up paddle boards are created with two specific factors in mind. The first is stability as you don’t want to fall off of the board while you’re trying to reel in a big catch. The second is height off of the water. Many of the SUPs made for fishing include things like rod holders and fish finders. If you plan mainly to fish with your SUP, you want to look at one of these paddle boards. However, some people find that a touring or all-around paddle board also works well. Typically, those who are fishing on their boards want to have a reasonable weight capacity. You might be carrying a tackle box, gear, and then need to have a place to carry the fish you catch. As such, this is something you shouldn’t overlook when choosing the right SUP. When we talk about volume, that refers to how buoyant the board will be in the water. This is another important aspect and the higher the volume is, the more weight the board will be able to hold. 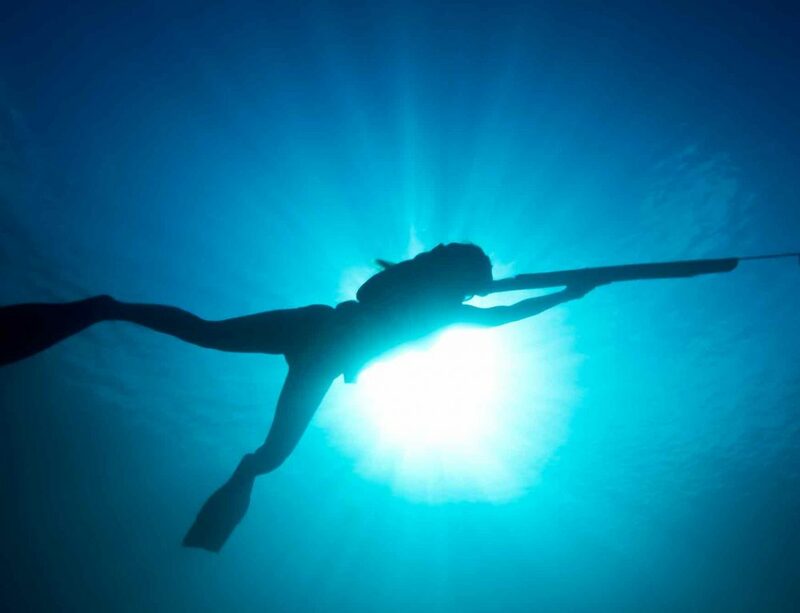 You’ll find that SUPs tend to range in length from around seven feet up to 14 feet. This is another situation where larger tends to be better for someone who intends to fish. While the length does have a relation to the speed and ability to maneuver, it also has an effect on stability and how much room you have to store items. Most fishing paddle boards will be around ten to 12 feet in length, while longer ones are used for speed and touring and shorter ones are usually used for surfing. Width is also highly important and there are a few things to keep in mind. Higher width can make a board slower which may or may not matter to someone who is fishing. Body type also counts here as narrow boards are best for smaller riders. You also want to think about your ability level as those who are more experienced may be more comfortable with a narrow board. However, for someone fishing, wider tends to be better as it gives you extra space. The last thing to think about in terms of the dimensions of the paddle board is thickness. This is especially important when it comes to fishing. Most fishing paddle boards have a thickness of around five to six inches, although some may be slightly less or thicker. Now that you know what to look for in a fishing SUP and you have a list of the best ones on the market, you are well on your way to having a great time out on the water fishing. Keep our tips in mind and look through the boards on this list and you’re sure to find one that works for you. Good luck!